Is there any advice on how to identify fingerprints. In all the books with the drawings I can easily say what is what, but on real prints I cannot. Unlike the books they are so unclear. I have just taken my own and I cannot say what any of them are. jeanette wrote: Is there any advice on how to identify fingerprints. In all the books with the drawings I can easily say what is what, but on real prints I cannot. Unlike the books they are so unclear. I have just taken my own and I cannot say what any of them are. Well, first of all one needs to have 'sharp eyes' - for observing fingerprints is usually a matter of details. 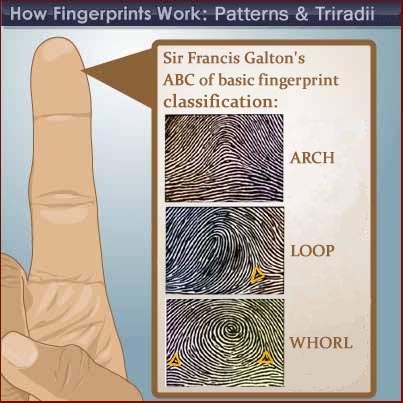 Second, it is important to become aware of the role of the so-called 'triradius' (sometimes called: delta, apex) - for after identifying the triradii in a fingerprint, it is usually quite easy to classify far most fingerprints. * PS. 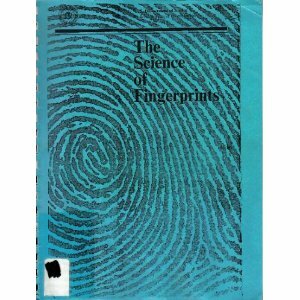 Just in case you're also using Richard Unger's method (with his book or books presented by his students), please be aware that his method doesn't follow the normal method that is used all over the world to identify a fingerprint. Thanks verymuch for the reply and information, when I get time I will look it all up. This has reminded me of when my husband died and a friend of mine sat with me and, in trying to comfort me, said that she thought that of all the billions of people that had died it was not possible that all these people could go to this place called heaven, and I said I thought that was right, but now when I realise that all these billions of people do not have the same fingerprints I think anything is possible. Thanks again for the information. If you are able to post your fingerprints here, we can have a look. composite also has 2 triradii with "s" shape in centre. I think you're right - anything is possible! I would love to find out what my fingerprints are but I don't know how to post them and I don't even know how to go about photgraphing them. After the body position discussion I am convinced I must have simple arches. Fixed ideas,steeped and stuck in tradition. Thanks again for the advice. Jeanette, if you have a digital camera take a photo of each finger and then when you post it, label it (right thumb) etc. Or if you don't have access to a digital camera, you can put lipstick on each finger on one hand, then roll each finger on a piece of paper. If you have a way to scan, you can scan that paper, with each finger labeled, and then post it as an attachment. If you don't have the capacity to do either of these, do you have any friends who have digital photo equipment? Jeanette do you have hand printing equipment? That would consist of linoleum board, printers block ink and a roller? It would be best to purchase Jennifer Hirsch's book, she has well detailed fingerprints in their, the book is called "God Given Glyphs", then another book that helps determine fingerprints is "Destiny at your fingerprints" by Ronelle Coburn. I have a fingerprint on my left Thumb, and no one was able to identify it, but in Ronelle's book she gives the four main types and then the composites, which is very important. Thamks. I will look and see how much the books are. Both books are 250ZAR, which is $33, but will be a lot cheaper in the United States. On Amazon, the "Destiny at your fingertips" by Ronelle Coburn is $12 new and used is $1.85. Click here! Ron wrote: Both books are 250ZAR, which is $33, but will be a lot cheaper in the United States. On Amazon, the "Destiny at your fingertips" by Ronelle Coburn is $12 new and used is $1.85. Click here! I have just ordered Destiny at your Fingertips, so that will do me for now and see if the other appears somewhere cheaper. Thanks a lot. After re-reading your request about your problem with identifying your own fingerprints, I am not sure that any book will help any further. By the way... did you notice Lynn's advice regarding using a magnifying glass??? For, I think we all should be aware that quite a lot of people's eyesight is simply not good enough to make the necessary detailed observations on fingerprints with bare eyes only - to find the one and only correct classification. I hope this suggestion will become helpful for you anyhow. I have a square piece of glass, printers ink, a roller and a magnifying glass. I am sure everything is suitable but not so sure about the magnifying glass. Is there a special type that should be used? Thanks for all your advice. Jeanette, the magnifying glass is to look directly at your fingerprints. It's not part of the printing process. It doesn't matter what type you use as longa is works for you to see your fingerprints. Good lighting is really important too. I use an OTT lamp and high intensity lights to look at fingerprints. When making hand prints or fingerprints, don't use too much ink or it will be black and hard to see the fine lines. It can take a bit of practice so be patient with yourself. So the magnifying glass is used to look at the fingerprints on the live hand. I thought they would be easier to see from a good ink print. Pamelah wrote: Jeanette, the magnifying glass is to look directly at your fingerprints. It's not part of the printing process. It doesn't matter what type you use as longa is works for you to see your fingerprints. Good lighting is really important too. I use an OTT lamp and high intensity lights to look at fingerprints. Jeanette, I can confirm all points made by Pamelah - though of course you can also use the magnifying glass for looking at fingerprints on paper! Yes, especially the 'light source' is another important fact to consider (though normal natural light should usually be enough). There are even magnifying glasses with a light-source included!! By the way, while using the combi of magnifying glass + proper light... when your eye-sight is no longer as good as during your child years, then you should be aware that you will probably need a very strong magnifying glass to see the skin ridges. Are you actually able to see the skin-ridges? And if your answer is a 'yes': is that with- or without using your magnifying glass? PS. If you can see the skin ridges, then it is probably a matter of experience to learn recognizing your fingerprints (and later the fingerprints of others, etc). Jeanette, both are true. You'll find out when you actually do both of these things yourself. Then it will be your personal experience, which is always the best! Yes, I can see the ridges, so I suppose it is a matter of practice and trying to differentiate. One final question, where would I buy a strong magnifying glass. One of the first books I read recommended from an optician, I went to one and they were expensive. Thanks. or at book store or a office supply store. Hi Pamelah, Thanks for telling me that. I would never have known to go there. Great. Okay Jeanette, great that you can see the skin ridges! Then the next step would be... can you find a 'triradius' in any of your fingerprints?? Jeanette, the role of the 'triradius' is always very important... because if your are able to observe how many triradii are included in one single finger print, that usually provides as solid basis for a permanent classification. The picture below illustrates that in a 'whorl' there are always 2 triradii involved, in a loop always 1 triadius, and in an arch... there is no triradius at all! When you understand this principle, and when your able to apply that to your fingerprints... you've probably made a huge step ahead!! Jeanette, does this make sense for you so far? And are you able to apply these guidelines on the 'triradus' on the fingerprint of your thumbs - which display usually the largest fingerprints of all five fingers!? PS. You mentioned that you already have a magnifying glass. Because you described that you ARE able to see the skin ridges, are you sure that you need anotherone? - Maybe your local book/magazine store can provide you one! Jeanette, my friend got a really good magnifying glass from one of the "Pound" shops, where everything costs £1. !! As Pamelah mentioned, I've got one with an extra little circle in the glass that gives higher magnification, great when you need to 'zoom in'. I had it for 20 years so can't remember where I bought it. If you have a Lidl supermarket in Paisley (or Aldi, I think they have similar stock), occasionally they have offers on various 'gadgets'. I was lucky to find a great magnifying glass, high quality magnification, with a row of LED lights all round the circumference to light up the hand. Great when working at fairs if electricity isn't provided & I can't use my lamp. I have just looked at my thumbs and I think they are loops, but they are very small loops and very low down. I am now wondering if they are a type of whorl. These drawings you gave I have seen them in books and I cannot understand them. To me they are just wavy lines. On the examples of loop,arch and whorl where the drawn examples on them. I am waiting on that book I ordered, so see if that is any help. It's a pity I don't know anybody who knows about this, for I need someone to sit with me and show me. Thanks so much for your help. Lynn wrote: Jeanette, my friend got a really good magnifying glass from one of the "Pound" shops, where everything costs £1. !! As Pamelah mentioned, I've got one with an extra little circle in the glass that gives higher magnification, great when you need to 'zoom in'. I had it for 20 years so can't remember where I bought it. There are plenty of pound shops in Paisley and I have Aldi and Lidl near by too. The magnifying glass I have I got in a £ shop, but I thought there was maybe better. It has a light, but it is broken. I am going to Paisley now so I will have a look in the £ shops. Maybe monday I will have a look in Aldi and Lidl. Thanks so much. Small (ulnair) loops are quite common on the thumb is quite normal. By the way, you didn't mention... were you able to find the triradii in the picture that I shared? NOTICE: In the picture they are marked with a small 'piramide' (triangle)... but these are just marks, so usually there is no real 'piramide' (nor a triangle)!! And... were you able to find the triradius in your thumb fingerprints? If there is only one triradius at both thumbs, then you probably indeed have a loop at both thumbs.